Each morning the children awake and anxiously look outside to see if it has snowed. Monday, Tuesday, Wednesday, and Thursday go by and there's still no sign of snow!Friday is the children's last hope for a day of fun in the snow. 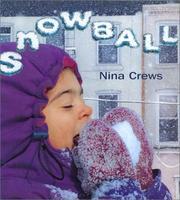 Crews, Nina, “Snowball,” Children's Picture Book Database at Miami University, accessed April 24, 2019, https://dlp.lib.miamioh.edu/picturebook/items/show/7470.